Because many organizations use Microsoft SQL databases to store sensitive data, such as health records or credit card information, securing SQL Server and passing SQL compliance checks there is a top priority. The most common regulatory compliance standards, such as HIPAA, PCI DSS and SOX, require you to provide evidence that appropriate SQL Server security controls are in place. But getting your arms around compliance is far from easy. Is there a way to take this load off your shoulders and more easily ensure that your security controls align with industry standards and best practices? Because Microsoft SQL Server databases contain organizations’ most sensitive data and have to maintain high availability 24/7, they are prime targets for threats both from the inside and outside. Violations such as breaches can result in SQL Server compliance fines. Accordingly, a solid security compliance strategy must go far beyond transparent data encryption — you need efficient auditing and compliance reporting. But before we jump into how you can streamline SQL Server audit and compliance, let’s take a look at the areas that you need to get covered to secure your SQL Server environment. 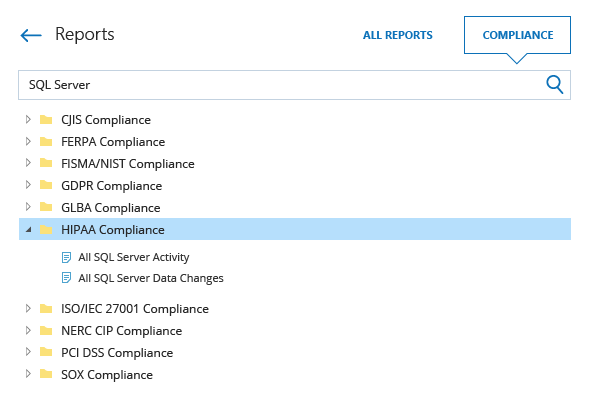 Following the SQL Server compliance and security best practices below will help you pass HIPAA, PCI and other compliance audits, as well as FERPA, GLBA, etc. Encrypt your data as a first step towards protecting it from exfiltration. But don’t mistake encryption for complete data protection. Enable risk assessment of your SQL Server ecosystem as part of your ongoing SQL database administration to identify vulnerabilities and security gaps that can be used as an entry point to your sensitive data. Keep an eye on users and user groups by streamlining your auditing and compliance reporting processes and implementing reliable account management to prevent privilege escalation and abuse. Establish effective authentication control for database logins to choke off unauthorized access events before it’s too late. Establish strict data access controls to secure data against unauthorized and unnecessary access. Maintain ongoing SQL Server audit logging to track all changes and access events and protect server availability and performance. Ensure incident response procedures are up and running to facilitate disaster recovery; it’s wise to assume you will suffer an attack at some point. Stay on top of new and unknown database security vulnerabilities by continuously evaluating your security posture. Prove to a compliance manager that your SQL Server security controls align with compliance requirements by providing insightful reports. Ensure that your SQL Server audit trail is security stored and you can access it at any time. Slash compliance preparation time by 50% with built-in reports, including ready-to-use compliance reports mapped to the most common regulatory standards, such as CJIS, FERPA, FISMA/NIST, GDPR, GLBA, HIPAA, ISO/IEC 27001, PCI DSS and SOX. Identify insider and outsider threats much faster by subscribing yourself and your security officers to the reports that each of you needs most and having them delivered automatically on the schedule you specify. Drill down into the audit data in minutes to get to the root cause of abnormal activity with the Google-like Interactive Search. Be the first to know about suspicious actions that could jeopardize your SQL Server security with custom alerts on the actions you deem most critical. Keep your consolidated SQL Server logs securely for over 10 years in the cost-effective two-tiered storage (SQL database + file-based) and access them any time an auditor knocks at your door.